The flexible benefits scheme (FBS) that saw Legal Ombudsman staff effectively paid hundreds of thousands of pounds on top of their salaries in the organisation’s first six years – until the government deemed the payments to be irregular – has been scrapped. It is part of action being taken by LeO to reduce its budget once more, and at £11.5m for 2016/17, it is £5m lower than it was five years ago. It will spend a further £2.1m on dealing with complaints about claims management companies. Overall, LeO is reducing its budget by 8.1% over last year. The FBS allowed staff to access a range of benefits, funded by LeO, up to a maximum of 3% of base salary; the FBS was not available for administrative reasons for the first 18 months, so staff were compensated by one-off payments worth 3% of salary instead. It accounted for £875,000 of the £1.2m in ‘novel and contentious’ payments that led to a governance crisis at LeO in late 2014 and ultimately the controversial departure of the chief legal ombudsman, Adam Sampson. That figure only represented the first four years of the FBS – it continued until the end of last month. However, last year LeO decided that it could not seek to recover FBS payments as they were contractual entitlements. LeO’s budget for 2016/17 – recently approved by the Legal Services Board (LSB) – said the scheme has been stopped, resulting in a reduction in staff costs. However, the budget document also suggested that changes to LeO’s benefits scheme increased the risk of higher staff turnover. The overall budget figure was predicated on dealing with 7,000 complaints in 2016/17 – slightly higher than the number in 2015/16. The budget said that the expected increase in conveyancing complaints, arising from a more active property market, has not occurred. Meanwhile, the LSB has decided to lift the performance targets it imposed on LeO last year using powers under section 121 of the Legal Services Act 2007. A letter from LSB chairman Sir Michael Pitt to Steve Green, his counterpart at the Office for Legal Complaints – the board that oversees LeO – said: “It is clear that there is a firm commitment across the OLC and its new senior management team to delivering the outcomes that are expected from the Legal Ombudsman scheme: that commitment has never been in doubt. “It remains the case, however, that performance of the scheme has not yet stabilised and there remains work to be done to demonstrate robustly and routinely that appropriate levels of performance against measures of quality, timeliness and cost are being met. 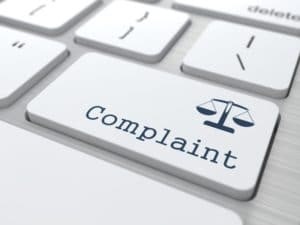 Also last week, the Law Society has reiterated its call for LeO to reintroduce its policy of two ‘free’ complaints before it charges lawyers its £400 case fee. The policy was ditched in 2013 but LeO had indicated it would review case fees later this year. The society said there should be “flexibility in LeO’s case fee mechanism to protect small firms and reduce the incentive for firms to settle complaints without merit before they are referred to LeO”. It also said LeO should utilise its existing powers to award costs against complainants where complaints were “clearly vexatious”.